Celebrate the music of the art deco era: it’s George Gershwin’s birthday today, Sept. 26! I’m a huge fan of George Gershwin. 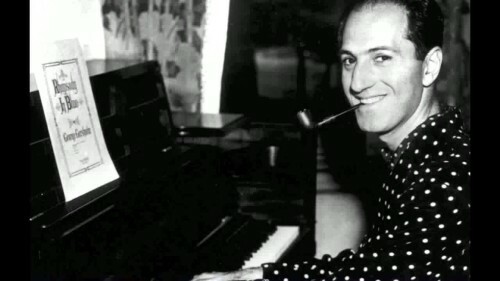 The way he perfectly fused jazz tunes with classical structure is second to none, and remarkable, given Gershwin himself felt like he wasn’t “legit” enough in the classical world, and didn’t have the same formal training as your typical classical music composer. He was, however, exposed to a lot of street music of Tin Pan Alley in New York City, hearing vaudeville tunes, early jazz, and songwriters all hustling their musical wares. What I love most about his music is the visceral quality of it – you’ll hear movement, the bustling big city, humour, wit, and the clatter of ice in a shaker. A dearly missed music writer for the Vancouver Sun, Lloyd Dykk, once described Gershwin’s music as “an art deco cocktail” and I loved that turn of phrase so much I wrote it down so I wouldn’t forget it. Here’s Gershwin himself playing his Three Preludes. It’s a straight-forward, business-like performance (compared to more liberties taken with tempo and ornamentation today) and not note perfect (which I find kind of reassuring, as when one admires Gershwin as much as I do, one kind of assumes he’s perfect at everything). If you let the video run, you’ll see a modern video next, which uses more flexibility with dynamics and pacing. I learned the Three Preludes when I was a music student at UBC. It took me forever to nail down the complex rhythms between the hands and the sudden big jumps. The final flourish, with the left hand crossing over the right, is as perilous as the end of Debussy’s “Jardins sous la Pluie” and SO MANY TIMES I missed the Eb at the end of the Gershwin. I may have broken down in tears a couple of times in one of those small practise rooms. George Gershwin was born September 26, 1898 in New York City, and died July 11, 1937, in Los Angeles.